Like most media buys, you are competing against other advertisers while striking the balance between lead quality and volume. The earlier position your question appears in a paths survey, the greater your lead volume. Our data shows that campaigns appearing on the first page attract approximately 30% more volume than those on page two. Remember, your data supplier needs to maximise their revenue per user, which means they will be ranking their advertisers placements by effective CPM. There’s only two ways you can increase your campaigns eCPM: increase your lead rate payout or increase your campaigns opt-in rate. The rest of this article will help you hack the algorithms to increase your campaigns ROI, enabling you to outperform your competitors and secure maximum volume. Whether you follow up by telephone or email, do so as quickly as possible while your prospects interest is piqued. Ensure your lead supplier is providing you with a live feed. Enable your email service to deliver an immediate autoresponder and if you’re using a call center investigate how you can prioritise these leads in the call queue. We have found that advertisers with recognised brands see a positive uplift in opt-ins when ensuring their branding is clear and prominent. Not only does this improve the opt-in rate but it ensures that a user can better recall their request for your contact when your follow up. Too often we see copy that focuses on the company rather than the benefit to the prospect. Ensure you craft emotive and benefit laden copy to acquire your top of funnel lead volume. Ensure you test the phrasing of your final opt-in question. Some campaigns act purely as a survey and fail to directly ask if the consumer would like to hear from the advertiser for a specified purpose. For UK data, from May 2018, such practice will not be compliant under the new GDPR legislation (you will need to gain explicit consent for contact). While a generic survey or vague closing question might give you a higher opt-in rate, consider its impact on your final goal and the ultimate conversion rate. As an alternative, test very specific questions that lead to higher buyer intent. What you lose in lead volume you may gain in ROI. Of course this will affect your suppliers eCPM, however, with a greater revenue per lead you can counter lower positioning by bidding up on your lead rate. If your sponsored question campaign relies on email, then your email deliverability is going to be critical for your campaign performance. A recent test of coregistration advertisers showed as many as 75% of advertisers email follow-ups were going straight to junk on the most popular ISPs. Firstly make sure your data supplier is providing validated data. By using services such as BriteVerify your suppliers can ensure they are sending you emails that will not hard bounce. Not only saving direct costs on undeliverable data but preventing harm to your emails IP reputation. Email deliverability is a complex topic and and an ever moving target, but invest some time in understanding how tools such as http://mxtoolbox.com along with postmaster services such as https://gmail.com/postmaster/ and https://mail.live.com/mail/postmaster.aspx can help you. To drive scalable ROI against your lead generation campaign then you have to be able to access data. Data that allows you to drill down to your final conversion goal. Ideally your reporting will allow you to identify conversion rates and ROI. This will include cohorts of demographics and referring device types (tablet, desktop, mobile), operating systems (is all your positive ROI from IOS users being negated by non performing Android users?) and ISPs (is that block on gmail killing your overall ROI?). Expect your data supplier to be able to help here. For example on the Clickwork7 paths, we can implement advertiser feedback loops, allowing our account managers to identify performance variables across our downstream traffic sources and individual paths. Almost no one is doing this. A consumer raises their hand in interest, in response, and at best they are receiving a few phone calls or an email or two. Take a look for a moment at the B2B practice of lead nurturing and consider how this can be applied to your B2C lead generation campaign. Yes, respond fast with your immediate and direct call to action. But rather than allowing non-responders to simply churn consider how you can nurture that initial interest to a final action. If you don’t have an existing content strategy, take a look at Buzzsumo.com for some inspiration on trending content that’s relevant to your market. 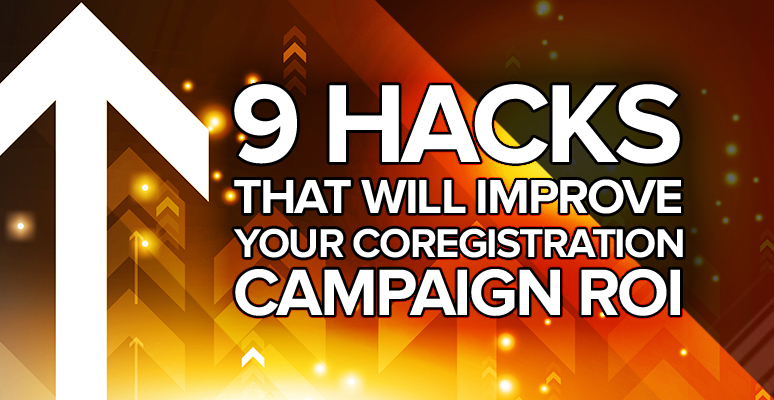 Those who can leverage a nurturing campaign will be able to out-compete the ‘suppliers auctions’ and create scalable coregistration campaigns. Great, but your sponsored question campaign doesn’t have to be limited to email and a call center. Import your leads emails into Facebook or Google Adwords (for Google Display) to create a custom audience to reach these prospects and reinforce your nurturing message. You could even target your google custom audience with in-stream YouTube video (we have seen some very positive early success with direct response video!). There is huge scope and opportunity for those investing in a multi-channel, lead nurturing campaign leveraging all of their lead generation activity and done right will allow you to access scalable volume through co-registration. We know the ideas presented above will make a dramatic difference to your campaign ROI. Email us now and we will discuss your campaign objectives, your current funnel and we will proactively support implementing these ideas to demonstrate how we can help you make ROI gains on your coregistration campaign.